These quilts are from our book, Curl-Up Quilts, which is available as an eBook. Click here to find it at pieceocake.com. Fabric note: We made our quilts with flannel, but you can use any fabric you like to make your quilts. 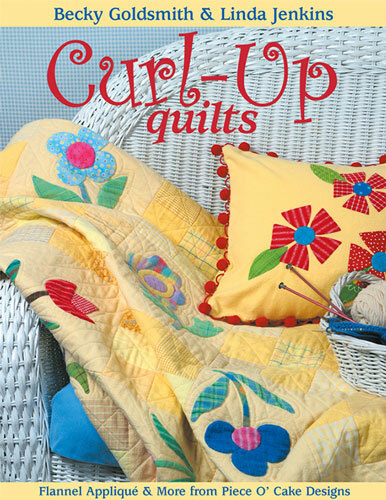 Sunny Days from the book Curl-Up Quilts by Becky Goldsmith & Linda Jenkins. Quilt by Linda Jenkins. Meow And Woof, below, is available as an individual epattern. Click here for more information. Meow Woof from the book Curl-Up Quilts by Becky Goldsmith & Linda Jenkins. Quilt by Linda Jenkins. May Baskets, below, is available as an individual epattern. Click here for more information. May Baskets from the book Curl-Up Quilts by Becky Goldsmith & Linda Jenkins. Quilt by Becky Goldsmith. Sweet Pea from the book Curl-Up Quilts by Becky Goldsmith & Linda Jenkins. Quilt by Becky Goldsmith. Firecracker Garden from the book Curl-Up Quilts by Becky Goldsmith & Linda Jenkins. Quilt by Becky Goldsmith. Fruit Trees from the book Curl-Up Quilts by Becky Goldsmith & Linda Jenkins. Quilt by Linda Jenkins.